This article was published in the August 2014 (#50) edition of Woodturning Design. INTRODUCTION: Earrings certainly are a small project, but I think you'll find doing them this way has more to offer than it appears at first glance. The earrings are not symmetrical along the vertical axis of one earring, but as a pair they are mirror images, symmetrical along the vertical axis of the wearer. Like ears are. The earrings are shaped entirely on the lathe at the same time using a waste block and turning on three centers. This allows you to independently shape the contours of the sides of the earrings giving you more design opportunities. The earrings end up the same size and thickness and symmetrical on the wearer's body automatically--if the waste block is centered perfectly. Alas that can be a very big if. The first time I tried making earrings this way I was delighted. But I was just lucky on the centering and had trouble duplicating the results when I tried again. Regardless of how careful I tried to be when mounting the waste block the drive or tailstock center would often veer off center enough to be visible in the final results (and it doesn't take much) due to irregularities in the grain of the waste block. So after a bit I set the idea aside for a while. When making Roundel ornaments earlier this year which are inordinately sensitive to centering errors I figured out a solution. Instead of trying to mount exactly centered between existing surfaces it would be easier to trim the surfaces equidistant to an existing center. Sort of like it's often easier to trim the rim of a disc true to a hole than it is to drill a hole exactly in the middle of a disc. I mounted the waste block on the lathe and turned a tenon on each end. Then I used a C-jig on the table saw that registered on the tenons to trim the sides of the block equidistant to the existing centers. Using laminated stock shows off the contours of the earrings nicely. You can make your own laminated stock, of course, but in the pictures I use bias cut jumbo Dymondwood pen blanks. Each pen blank will make two sets of earrings. Briefly the blanks are prepared. The waste block has two equal tenons turned on the lathe, then it's trimmed using a C-jig on the table saw. The earring blanks are mounted on the waste block using temporary joints. The earrings are then shaped on the lathes using three centers, sanding after each turning before remounting. Adding finish and some jewelry fittings completes the earrings. PREPARING THE EARRING BLANKS: As it's easier to sand pieces you can hold on to, begin by sanding the Dymondwood blanks flat and smooth on the banded surfaces. There is no need to sand the diagonally striped surfaces. One way to sand the banded surfaces is to place a sheet of abrasive on a flat surface and moving the blank back and forth by hand, as in Fig. 1. You can plane or power sand the surfaces, of course, but do try to keep the bands straight across the blank instead of skewed or curved as this would make it harder to produce symmetrical patterns in the finished earrings. The sanded blank is shown in Fig. 2. Figure #1: Sanding the Dymondwood blank flat. Figure #2: The sanded blank. Now cut the Dymondwood blank in half as in Fig. 3. Note that the saw is cutting parallel to the banded surfaces. As I'm using a wide blade I can use a fence. The push stick has a notch at the back to push the blank. It also has a magnet imbedded in it so it stores conveniently on any surface of my bandsaw. This will yield 2" long blanks for 2 sets of earrings. The sanded surfaces will become the backs of the earrings. Figure #3: Resawing the Dymondwood blank. Now cut the the blanks to length. The pictures follow using a table saw sled but you can use a bandsaw as long as the cuts are at right angles and the bands line up the same on the blanks. Trim one end of the blank. Then cut off a 2" blank. Now hold the cut off blank against the remainder so that the bands line up, as in Fig. 4, and mark where to cut so that the bands are the same in both blanks. Fig. 5 shows the completed earring blanks. Figure #4: Marking where to cut the second blank. Figure #5: The completed earring blanks. PREPARING THE WASTE BLOCK: The waste block is made from 1.5" square pine. I used a Radiata Pine 2x2 from Home Depot which comes already 1.5" x 1.5" with square sides and sharp corners but you can easily mill your own from whatever you have on hand. Trim the end square using a table saw sled as it's easier to see marks on a cleanly sawn surface. Then cut the waste block 3" long as in Fig. 6. Figure #6: Cutting the waste block to length. The three centers the waste block will be mounted on need to be in a straight line parallel to the surfaces the earring blanks are mounted on. 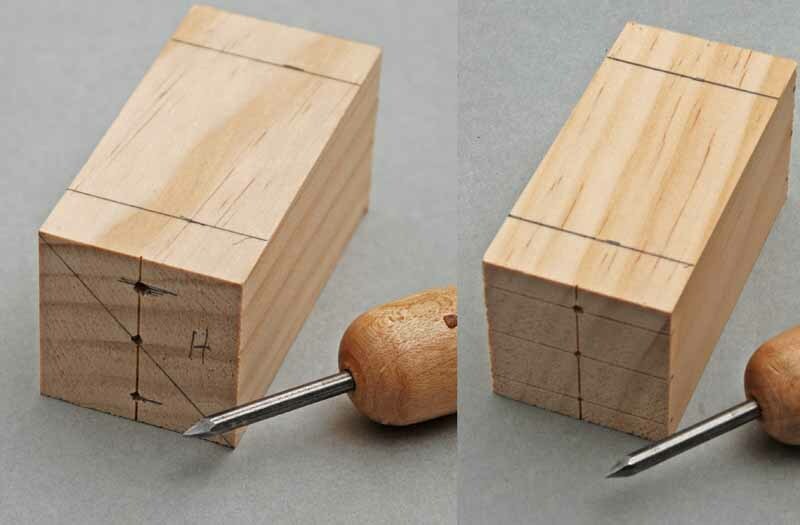 This is easier if you mark the center line with a shallow scroll saw or bandsaw cut, as an awl or the center point will naturally go to the middle of the groove. Make sure your table is square to the blade as in Fig. 7. Mark the center of each end on a face of the waste block and use the saw to make a shallow cut at the mark. If you prefer, select a face at right angles to the first marked face and make marks at the center and 1/2" out both ways from the center and make shallow cuts at these marks. Intersections of the cuts will then mark each center. If not, use a corner to corner diagonal line to find the center of the shallow cut, and measure out 1/2" in each direction from center along the cut. Use an awl to start a dimple at each center. Label one end with an "H" for headstock. Measure 1/2" from each end on one long face of the waste block and use a square to draw perpendicular lines across the block at the marks to guide you when cutting the length of the tenons. The marked waste block is shown in Fig. 8. Figure #7: Squaring the saw table. Figure #8: Two ways to mark the waste block. Mount the waste block between cup centers as in Fig. 9. If your cup centers have adjustable points, extend the center points so that the point is about 1/8" proud of the cup rim. It is difficult to see past the rim where the point actually is. Extending the point a little lets you engage easily just the point loosely in the dimple without pressure. If you can easily turn the blank the point is indeed in the starting dimple. Figure #9: The waste block mounted on the lathe. Using the lines as a guide make a pommel cut at each end. Then reduce the blank to round at each end. Now use a parting tool and calipers to size the tenons as in Fig. 10. I used 1.4". The exact size isn't important so long as it's a little less than 1.5" and both are the same. Then cut both entire tenons to size as in Fig. 11. Figure #10: After sizing one of the tenons. Figure #11: Both tenons are complete. Make a C-jig to trim the sides of the waste block. You don't need to slavishly follow the dimensions I used as long as the C opening is fitted to work with the waste block, and it's more than half the height of the waste block. Cut a 4" long piece of 5/4 x 6 Radiata Pine. On one short side cut a C opening. It should be 7/16" from the back edge(so that the end of the waste block bears against the sled fence), about 3/4" deep, and 2-3/16" wide. Rip a 3/16" thick, 1-1/2" wide and 3" long piece off a 2 x 2 piece of Radiata Pine. Glue this piece to the end of the waste block opposite the C to serve as a pivot for the hold down. Cut a 7" long piece of 2x2 Radiata Pine for the hold down to keep your fingers out of the way of the blade. 3/4" from one end cut a 1/4" wide by 1/4" dado using multiple passes on the table saw to allow the hold down to rest on the pivot. Trim away a wedge off the bottom edge with the band saw leaving a rounded over portion at the end. Cover the rounded over tip with 2 mm craft foam to help it hold the waste block securely. Clamp the C-jig to your sled and trim a little off the C side of the jig so that the arms of the C are exactly even and parallel to the blade. The completed C-jig is shown in Fig. 12. The extra notch in the hold down is there because I originally made it for a different sized C-jig for the Roundel Ornament. Place the waste block in the opening of the C-jig and slide the jig along the fence so that the blade will skim one of the sides (don't remove so much that you cut into the tenon). Clamp the C-jig in place against your sled fence. Using the hold down, pass the waste block through the blade as in Fig. 13, then rotate it 180 ° and trim again. Check the waste block to make sure the entire surface of both sides have been trimmed. The last step in preparing the waste block is to draw centered lines the width of your earring blanks on the trimmed faces. A marking gauge, if you have one, is the most efficient way to do this. If your earring blanks are not the same length as the length of the flat face of the waste block draw guide lines on each face so you can mount both blanks identically. The completed waste is shown in Fig. 14. Figure #13: Trimming the waste block with the C-jig. Figure #14: The completed waste block. MOUNTING THE BLANKS TO THE WASTE BLOCK: I am dominantly right handed so it's easier for me to cut from right to left with the skew. If you also have a preferred cutting direction for finishing cuts you'll want to orient the blanks so that you'll be cutting downhill on the plies of the laminate when cutting this way. Even if you don't have a preferred direction, be sure to orient the blanks the same way. To insure this, place the blanks with the sanded side down next to one another so that the plies angle the same way. The bands should look the same. Make a mark in the upper right corner of both blanks. With the waste block oriented so that the end marked for the headstock is on the left, make corresponding marks in the upper right corner of the trimmed faces of the waste block. The marked blanks and waste block are shown in Fig. 15. Figure # 15: Blanks marked for mounting. Put blue masking tape on the sanded surfaces of the blanks and trim to size. You do not need to put tape on the waste block as it will be discarded. Spread a thin coat of wood glue on the tape as in Fig. 16 and carefully align the blanks in position using the guide lines. Then clamp the blanks in place as in Fig. 17 and allow the glue to cure. Figure #16: Set-up for temporarily gluing on the blanks. Figure #17: Blanks clamped to the waste block. TURNING THE EARRINGS: Before mounting for turning it's a good idea to temporarily mount the waste block at the eccentric centers. This is because it takes more pressure to set the centers initially than it does to drive the blank once the centers are set, and after the second turning the block will be weaker and more susceptible to cracking. Mount the waste block with the blanks attached on the lathe as in Fig. 18, being sure to use the exact same centers and getting the end marked for the headstock at the headstock. Figure #18: Mounted for the first turning. After checking to make sure than nothing fouls on your tool rest, turn on the lathe and visibly check the tenons to make sure the block is mounted correctly. Use a spindle roughing gouge to round over the faces of the blanks. It won't take much, so stop the lathe and check your progress frequently. If you're comfortable with the skew you can use it to refine the surface before sanding. Fig. 19 shows the blanks after rounding the faces. You should sand after each turning step. Backing up the abrasive with your finger or with a sanding foam block as well as using light pressure will help keep dubbing over the leading edges to a minimum. After making a few sets of earrings you may find, depending on your design and thickness of the blanks, that all of the surface from the first turning is turned away during the second and third turning, in which case you can omit sanding after the first turning. Figure #19: After the first turning. Mount the block in one of the eccentric positions (as the earrings will be mirror images of each other it really doesn't matter which) as in Fig. 20. As the blank is now mounted off center, before turning the lathe on you must move the tool rest back and turn the speed down. Turn on the lathe and adjust the lathe to a comfortable speed where you can cut well but the lathe doesn't vibrate. 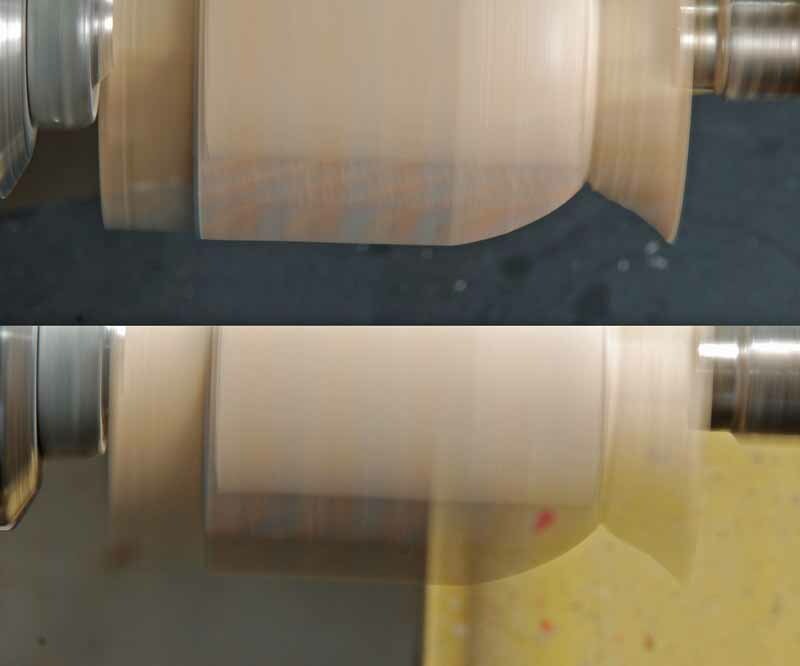 Use the spindle roughing gouge to reduce the diameter until you have a clean edge between both of the blanks and the waste block as in Fig. 21. You will have to stop the lathe frequently and look to avoid unnecessarily narrowing the blanks. Figure #20: Mounted for the second turning. Figure #21: Turned to a clean edge. The next step is to shape the profile of one side of the blanks. This is easier to do if you can see what you're doing. To help with this find something dark, such as black poster board and place it on the lathe bed to provide a dark featureless background. Move a lamp so the the blank is lit from the side. Fig. 22 shows the improvement in visibility this provides. The bottom half of Fig. 22 shows the normal lathe bed with usual top lighting. The top half of the image shows the effect of using a black background and side lighting. Fig. 23 shows the lighting set-up. Figure #22: Top versus side lighting. Figure #23: The side lighting set-up. Using a detail spindle gouge, round over the blank at the tailstock end. You need to continue until the rounded portion is about halfway where the blank and waste block meet as in Fig. 24. Do try to leave the waste block a little thicker at the end than I did. Similarly round over the headstock end then smooth out the profile to a fair curve as in Fig. 25. Sand the turned surface before remounting. Figure #24: After shaping the blank at the tailstock end. Figure #25: Second turning complete. Remount the block at the other pair of eccentric centers as in Fig. 26. Round over both ends of the blank as you did in the second turning. The result is shown in Fig. 27. Then add a shallow cove as in Fig. 28, or some other profile variation, so the sides look deliberately different. Then sand. There will be some inevitable dubbing over of the leading edge on one earring. You can accept this, reverse the lathe to equalizing the dubbing over, or sand by hand. The last option seems like sacrilege to me, but as it is a very small area it will at least go quickly. Figure #26: Mounted for third turning. Figure #27: After rounding over both ends. Figure #28 Completed third turning. FINISHING: Drill holes for mounting the earrings while the earrings are still mounted on the waste block on the lathe. This will conveniently hold the earrings and provide a secure backup for them at the same time. Begin by using an awl to start the hole as in Fig. 29. Then drill the mounting holes as in Fig. 30. The size hole is fairly arbitrary, but small and sharp is less likely to blow out to the side of all of your work. I used something in the neighborhood of 3/32". Figure #29: Making drill starter depressions with an awl. Figure #30: After drilling the mounting holes. Remove the earrings from the waste block with a utility knife as in Fig. 31. Be sure to keep all fingers above the blade and use a work surface you won't mind scratching. Remove any blue tape clinging to the back of the earring and gently round over the sharp edges around the back of the earrings with 320 grit abrasive. You can make elongated S-shaped hangers out of wire if you wish to finish with spray lacquer as in Fig. 32. The visible small brass wire S-hangers are suspended from larger S-hangers suspended from plumbing. Choose jewelry fittings of a quality to match your intent and customer. You can get costume jewelry quality fittings at a store such as Michael's. I used two sizes of split rings and pre-made hangers. The earrings seem to hang more naturally with two split rings. Using a small pair of needle nosed pliers (preferably smooth jawed) open the split rings by twisting the ends of the ring in different directions out of the plane of the ring and close them after inserting by twisting the opposite way. As there is spring-back, you won't be able to close the split rings if you open the rings by prying the ends tangentially. Fig. 33 shows the completed earrings. Figure #31: Removing the earrings from the waste block. Figure #32: Earrings suspended from S-hooks for finishing. Figure 32-1: How to open split rings. Figure #33: The completed earrings. VARIATIONS: You can vary the side profiles as you wish for different effects as in Fig. 34. Fig. 35 shows earring made the same way using acrylic. You may also vary the length of the blank if your recipient favors less dangly earrings. Fig. 36 shows a pair of earrings starting with a 1-1/4" blank. Use the same size waste block if possible so you don't have to make another C-jig. Figure #34: Earrings with a rounded V-groove. Figure #35: Acrylic earrings with narrower tops. Figure #36: Less dangly earrings. Jumbo Dymondwood pen blank, 1-1/2" x 1-1/2" x 3" pine waste block, small 5/4 and 2x2 stock for C-jig, 2mm craft foam, blue tape, wood glue, abrasives, jewelry fittings, finish of choice. Spindle roughing gouge, detail spindle gouge, skew, parting tool, calipers, cup drive and tailstock centers, small clamps, awl, utility knife. AUTHOR: David Reed Smith welcomes questions and comments at David@DavidReedSmith.com. This article, possibly with additional photos, will join more than 60 others on his web site at www.DavidReedSmith.com.